Flying car is a car which can run on the road as well as fly on the sky. In Vienna car exhibition a flying car is also display. This is supposed to be the first flying car in the world. This is amazing news in the world. You can watch in this page amazing video on flying car. In this page you can see the images of this car and information and news in Urdu too. The flying car is an amazing car, presenting in Vienna exhibition, is six meter long made by steel and carbon. 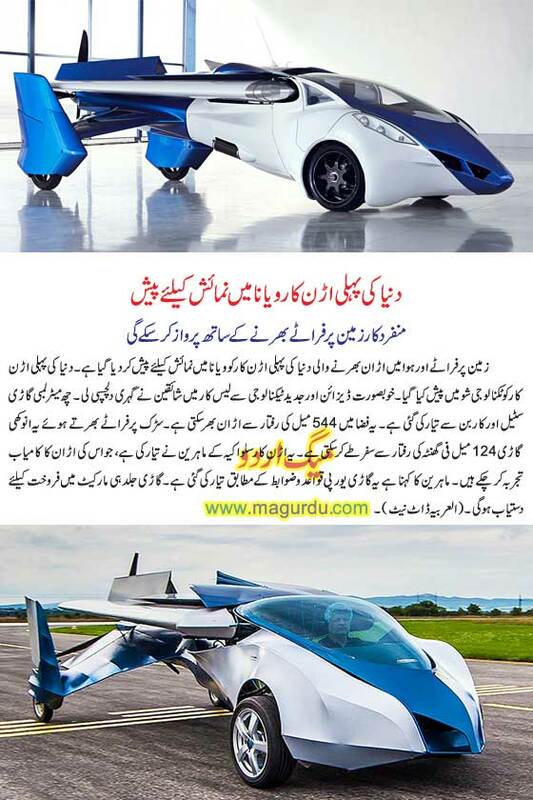 This amazing flying car having beautiful design and made by latest technology, is highly appreciated by the people. It can fly at a speed of 544 miles per hour. On road in can run up to 124 miles per hour. This flying car is made by Slovakia engineers. They experimented successfully. According to experts this flying car is made according to rules and regulations of Europe. This flying car will be available in the market and people can by and fly this car very soon. Flying car is also called a roadable aircraft. It is a hybrid vehicle, means a vehicle having both the ability to run on the road as well as fly like an aircraft. Roadable aircraft are either in integrated or modular. In integrated style all components can be carried in the vehicle, or on a trailer attached to the vehicle. In modular style some aeronautical sections are left at the airport while the vehicle is driven.